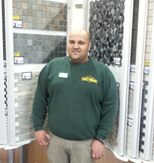 Hi my names Michael I’m the manager at Tile Choice Perry Barr, Myself and my dedicated staff are more than welcome to walk you round our showroom, where you can see beautifully tiled displays with new and current products alongside old classics. We are fully trained in calculating measurements and suggesting layout designs due to many years of experience. We also pride ourselves on customer service along with detailed knowledge of tile accessories and aftercare products. Come visit us as we are very competitive with price and have many in store offers too, we also offer a sample service alongside a buy back service for any excess unused products brought from us. We look forward to seeing you soon.